Served until 12:00pm. If you don’t see something you like please ask, if we have got it we will make it for you. Please ask about allergens all our staff will be able to help you. Gluten free bread available. 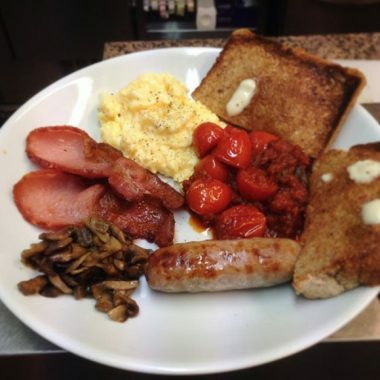 2 rashers of smoked back bacon 2 Redhill Farm Lincolnshire Sausages, Redhill Farm black pudding, 2 eggs any style, mushrooms and my Nonnas special recipe tomatoes all served with 2 slices of Welbourne Bakery toast. Your choice of tea or coffee and a glass of fruit juice. Special recipe breakfast tomatoes cooked how my Nanna used to do them. Add: Sausage, bacon – £1.50 each. Add: Egg, mushrooms – £1.00 per item.